James R: After a few lean weeks, the new releases deliver a biblically fat pull-list for me on Wednesday. 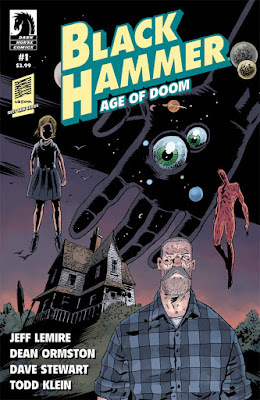 Starting at the top in every way, Black Hammer is back! It's arguable that it's never been away, with Jeff Lemire providing two fine 'Black Hammer Universe' books to tide us over, but with Black Hammer: Age of Doom #1 we're back in Rockwood and Black Hammer farm, beautifully illustrated by Dean Ormston. This will obviously be the first thing that I read, but it'll be closely followed by the undoubted comic of the moment, Tom King and Mitch Gerads' majestic Mister Miracle, which reaches issue #8 this week. King's run on Batman has slowly but surely won over readers over the last year (myself included) and the next issue sees Tony Daniel providing the art, and a tale featuring Booster Gold - fair to say, that's going to be a great read. That would normally be enough from DC, but the icing on the cake is the next instalment of Kurt Busiek and John Paul Leon's masterful alternative Batman tale, Creature Of The Night. Rounding things off, Image comics sees the continuation of two favourites of mine - firstly there's the next issue of the consistently great Descender from Jeff Lemire and Dustin Nguyen, and the other is the grand return of the month - Lazarus is back! As with Black Hammer, it's never been fully away thanks to the Lazarus +66 interlude series, but it's brilliant to see Michael Lark reunited with Greg Rucka, and the tale of Forever Carlyle back up and running. There's a very good reason that this book continues to win awards at the Paradoscars, and I'm sure I'm not alone in my excitement for this one. A great week in prospect then! Jo S: A couple of favourites wind up with final issues this week: the truly bizarre Vinegar Teeth closes out on issue #4, neatly avoiding outstaying its welcome, and Tales Of Suspense, which was at no risk at all of doing the same and will be missed. The cover art for this final episode is glorious and a framed version would certainly find its way to a wall near me if I had a room of my own! After a bit of a delay, Kurt Busiek and John Paul Leon bring us the third issue of Batman: Creature Of The Night: the first couple of issues of this were real treasure - beautifully illustrated and hauntingly written, the tale of Bruce Wainwright of Boston and his secret protector really caught the imagination and will take the end spot in the pile so I can relish it thoroughly. My issue #1 this week is Skyward from Image, a story of a future Earth where gravity has suddenly reduced to a fraction of what we're used to - this looks like ‘light’-hearted fun (sorry) with an adventure plot, plus I have a giggle imagining how incredible my hair would look in low-G. I've been enjoying The Further Adventures Of Nick Wilson very much - although this is a superhero book, thematically, it has been the exploration of what it means to grow up and mature beyond the years where you’re finding out who you are in the world which has touched me: finding joy in simple day-to-day things as much as drama and excitement. I have immensely mixed feelings about this week’s Mister Miracle #8. Surely the story ends when the baby arrives? Isn't that how it's supposed to work in the movies? Tom King’s writing about the maternity hospital ‘thing’, on the surface as pertaining to a god and a Fury but clearly written directly from personal experience, was so acutely familiar that I struggle to imagine how he can go on with the story from here - but then, that’s how it works, isn’t it? It's the moment when everything changes and you start your new life, going from BC (Before Child) to AD (Absolute Disarray) overnight. How will Scott and Big Barda handle it when baby makes three? I reckon Tom and Mitch have it in hand.